Sheltrex Smart Phone City is one of the super luxury apartment developed by Sheltrex Developers lies at Karjat West. The project spreads over a whopping 104 acres and has been designed by Hafeez Contractor. The project offers Studios, 1BHK, 2BHK &3BHK flats at very competitive and affordable price. Theseare sized between 693 and 1255 sq. ft. The project offers 24 storey towers with a solar power plant and dual plumbing/reuse system for waste water.It is well planned and is built with all modern amenities. 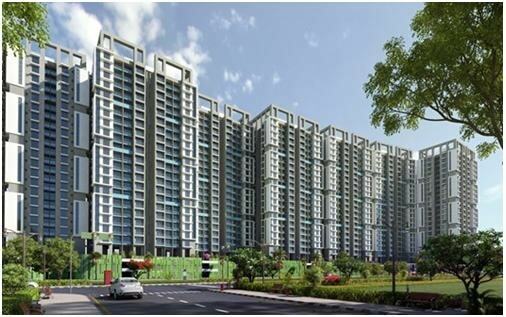 Sheltrex Smart Phone City is one of the super luxury development located in Karjat, Maharashtra. The project offers 1 BHK-2 BHK- 3 BHK flats at very competitive and affordable price. The city project hosts 20K flats from high rise, low rise and other several commercial areas. Accommodating a high school within the project as it covers 7 acres of land, hospital facility over 80,000 sq.ft. The complete design is constructed on 104 acres of area. Developed on 102 acres of land in the green city of Karjat. Karjat lies just 2 minutes away from the Karjat railway station. Space has been reserved for commercial areas such as business centres, malls and multiplexes to cater to the large consumer needs of the city residents. The project is divided into multiple ring roads one of which passes around the boundary of Mumbai. Karjat is conveniently located on this corridor. It will benefit tremendously from this high-speed development putting the city in a prominent light. Sheltrex is being constructed near Karjat Railway Station. The project is well equipped with all modern amenities such asIntercom, Power Backup, Washing Area, Vaastu Compliant, Security, Fire Alarm, Water purifier, Lifts, Swimming Pool, Water Storage, Maintenance Staff, Fitness Centre, GYM, Waste Disposal, Club house, Community Centre, Rain Water Harvesting, Shopping Centre with 2 multiplexes, Senior Citizen Park, Children's Park, Multi-Level Car Parking, Basketball & Tennis courts. Schools -Kes English Medium School, Good Shepherd Convent School, Calvary Baptist Bible College & Seminary, Tree House Play Group, ShardaMandir Secondary School, Engish Medium School. Hospitals -Dr.sabaleorthopedic hospital, Mayur Hospital, Shree Swami Samarth Nursing Home, Jain Hospital, Phadke Hospital, Pankaj Dental Clinic, Sanjivani Clinic. Pharmacies -Varad Medical & General Stores, Mahavir Medical, Tithee Enterprises, Aakanksha Medical & General Stores. Banks/ATMs - Axis Bank ATM, HDFC Bank ATM, Bank Of Baroda ATM, ICICI Bank ATM, BOI ATM, Vijaya Bank & ATM, State Bank of India ATM. Restaurants -Visawa Hotel, Namak Restaurant, Malvani Hotel, Rudra Chinese Corner, Pure Veg. Brother's Chinese, Thakare Hotel. Movie Theatres - Raj Nova Cinemas, Bhagwan Talkies, SP video cable, ND's Studio. Parks -Bhai Kotwal Udyan, Kotwal Nagar Ground, Nana Nani Park.